Amy has recommended that we turn Frank a quarter turn to the right to work the pants in horizontal rows. Work the first row from right to left, following the numbers. Then each lower row has each entry stitch always one hole below the entry hole above it as you go from side to side. I haven't tried it yet, but it looks like it will go smoother that way. And this is how is should look when you are finished (not my stitching). Isn't that overdyed thread just great? Save the compensation stitches for last. But if this doesn't work for you, I have found a stitch in Julia Key H. Snyder's book, Categories for Needlepoint Stitches, called "Back and Forth Herringbone". 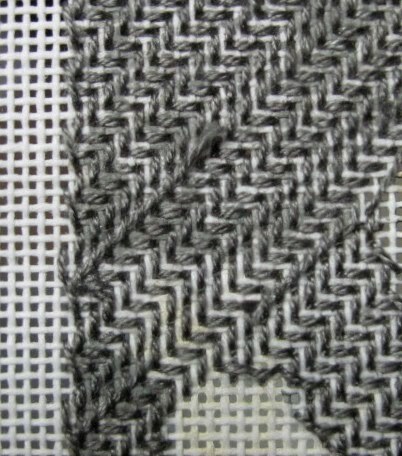 It looks very much like the one we are trying to stitch. Talk to you later. Linda just asked about Frank's nose. It is outlined with the same thread used in his other facial lines. Follow the picture for placement. I am hopelessly behind on Frank. But I think we all are. So I will report on progress when I make some. I will start on the second phase of the house next week for all of you who are stitching the house only. Please feel free to ask any questions. Even if I have not stitched the area in question, I will get an answer for you. Ladies, check out some tips from Kathy on the "Frank's pants" post. To make Patches easier to stitch, don't forget to baste the different parts of him before you stitch him. 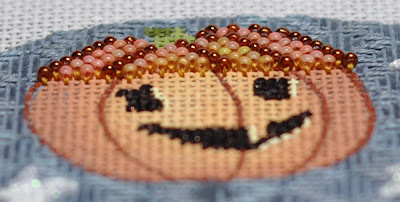 I know that you probably read the tip on this when you first read the guide, but the tip comes after his stitch directions and you may have forgotten about it by the time you are ready to stitch him. Basting makes it so much easier. Amy says, "I am not sure if Frank was an experiment before Patches was made or the other way around." He is made up of at least four different cat breeds. No wonder he looks disoriented! I just finished the pants, after ripping the first row a few times, I got into a grove and it wasn't too bad. Follow the stitch guide carefully, have plenty of quiet and lots of sun. I agree the look is great. Any tips on the jacket? I am having problems seeing the pattern. If you have tips please jump in. I remember having to concentrate on the jacket stitch, but it went smoothly. Turn your canvas by 1/4 to stitch the right side of the jacket. 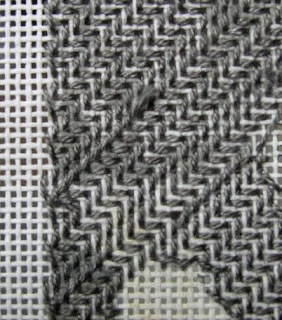 That allows you to continue to stitch from lower left to upper right. Also, I think the jacket on our canvases are painted differently than Amy's was, but it still works as it is an old worn-out jacket. I have finished the green and orange border and most of the cat. The cat is quite a collage. I love the way the extra stitches on the ears, which I haven't done yet, makes the cat look startled. I hope you are all doing well. We have another week to work on Frank. Notice I didn't say "finish"! I had time to do a few quick things today. Worked on the shoes and the pumpkin row. And I will do the lower background tonight. Need to finish some areas so I can get a sense of completion. I think I will do the cat tomorrow night, and the green and orange border. Sorry I got bogged down on the pants. I haven't given up on the stitch. I'm going to work on it on a practice canvas. Surely I can do this! Per the last post and it's accompanying comments, Frank's pants are hard to stitch. I sat down with Amy today to ask for tips. When she said, "Think of it as a 2 X 4 cross stitch." I thought I had a break-thru. But it didn't work out. I've tried the stitch again but I just can't get it. Because the rows pack so tightly together there is no room for error. And I keep making errors. I hate to give up the look of this stitch because Amy's choice works better with the whole thrift clothes thing, but we have a lot of work to do. So I may try using another stitch. There is the Regular Plaited Gobelin in Chapter 3 of Amy's Cookbook for Stitchers. Or, the stitch on this website, or this Gobelin Plaited Stitch. Bottom line, don't let this stitch keep you from having fun. I don't want you to worry about keeping up either. There should be no pressure here. Just think of this as a long term project that you are working on with others, at your own pace. I have not entirely finished Stirha, but I couldn't wait to stitch some on Frank. And here we are about to get the next part of the Haunted House. 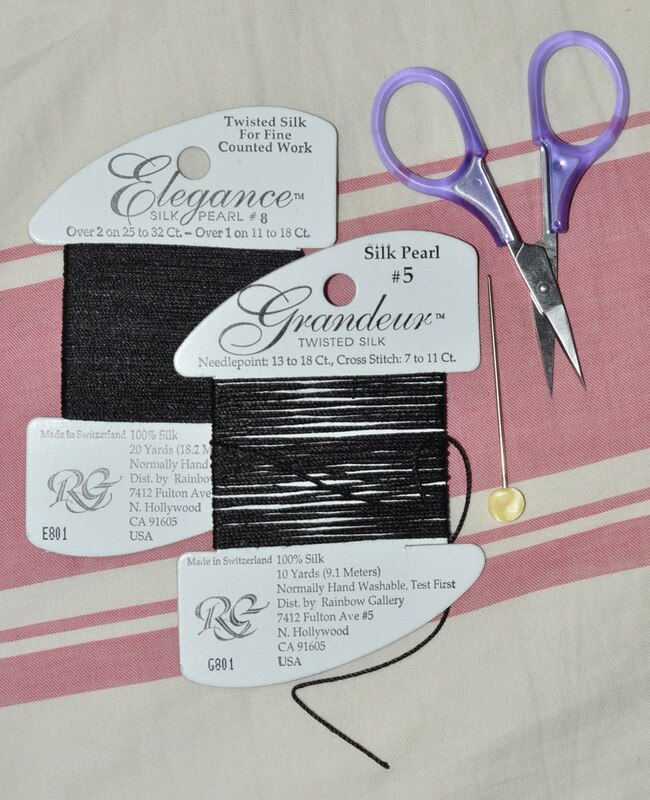 Isn't it great to get the package and go through the threads and stitchguide? So enjoy the process. Have fun! P.S. I'm going to try that stitch one more time before I give up! Have you ever decided to use Elegance (E801) instead of Grandeur (G801)? Mind you, both threads from Rainbow Gallery are wonderful. Both are Black... Silk... on a Rainbow Gallery card. But, during your TNNA project (Columbus / June 2010) pre-planning, you decide to use Elegance. Has Life ever distracted you? Both cards are within arms length. You don't realize anything is going on... until you look at the "almost used-up" Grandeur card. What the ....? Really?! I have resumed work on Frank. When I left off, I had done most of his T-shirt. However I was not happy with the top of it where it meets the collar. So as you see below, I took out the stitches to contemplate my next move. Then it occurred to me to take the collar stitches out, and then stitch the top of the T-shirt, and then stitch the collar over the top of the stitches. Ta Dah! It looks nice. Stitch order can be important! I kept two needles with the two purple threads going at the same time. It was easy, and it makes the T-shirt look real. Frank probably went to a Thrift Shop for such a nice T-shirt. But his jacket is gonna be really ragged. It is a fun stitch that I have never seen before. And using an overdyed thread along with a solid is fun to play with. Keep two needles going on this part too. By the way, take a minute and go to the page of the stitch guide referring to Frank's cat. Write in that the cat's whiskers are stitched in Kreinik Braid size 4, color #101...same as Rhett's. I wanted to share with you what's been going on in my world. Remember when I taught Kelly Clark's Katt Z. Witch class in January 2010 at the Long Beach TNNA Winter Market ? It was such an exciting time & opportunity. While in Long Beach, I met another designer, Judee from Needle Deeva. (Step into the Way-Back Machine with me... remember Vicky De Angelis won 1st place at ANG ... she stitched the Needle Deeva's Halloween Town. Yes, the same Needle Deeva wanted me to design a Stitch Guide for a new canvas! OMG... can you believe it?!) I am currently stitching one of her new designs (to be released June 2010) for another teaching experience at the June 2010 Columbus TNNA Market. Lucky you... here's a preview. I have put down all of my other stitching distractions to focus on this deadline. (Yes, Floating Cat Balloon... I will get back to you...) It has been really fun to stitch this project. 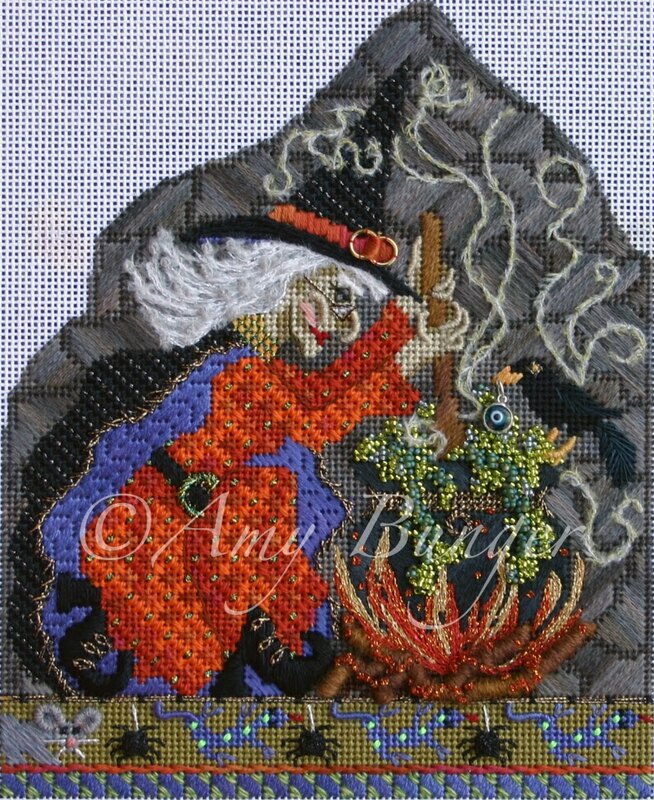 I will design the Stitch Guide, and it will be available through the Needle Deeva website. For the TNNA class, I plan to finish it into the Stirling Self-Finishing Shoulder Bag. Photos to come... stay tuned. I know that Peggy is furiously stitching Frank, and is having a grand time. Next on the Halloweenies agenda is Kit #2 for the Halloweenies Haunted House. Who knew Amy Bunger had carpentry skills? (I did!) And, for all of you doing the Halloweenies characters... just wait until you see Zombie Bride-Zilla! What a whoot! Kelly Clark & Amy B. continue their magic. After some careful nudging, I am going to go out on a limb and further describe the Glad Press 'n Seal technique as seen in DVD #5, Fancy Flowers. 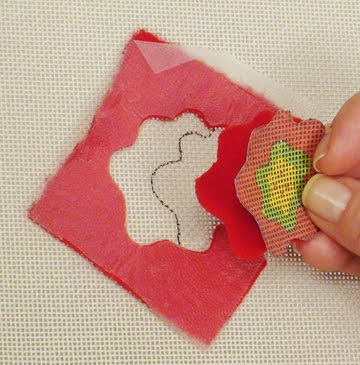 This is a wonderful method for holding your paper pattern in place while cutting out the piece of Felt; making it fun & easy to Appliquéd Felt to your needlepoint. The first photo, from DVD #5, shows Amy with a piece of Felt, a paper pattern, and the Glad Press 'n Seal covering them up. The second photo shows the newly cut piece of Felt. The Glad Press 'n Seal held the paper pattern in place onto the Felt, and was thin enough for precision cutting. Jan had a question: What if I can't find Glad Press 'n Seal, what else could I use? I would suggest Clear Contact Paper, or Clear Wide Sealing Tape. 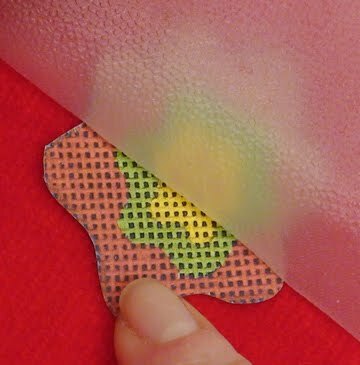 The idea is to use something to hold the paper pattern down onto the felt while you concentrate on the cutting. I was reading some of the posted comments, and had a wee-bit of information to contribute. Regarding the Glad Press 'n Seal technique Amy used in the Halloweenies: I haven't done it myself. However, I did watch her use the technique during DVD #5, Fancy Flowers. Amy used the Glad Press 'n Seal during her Appliquéd Felt method for Flower #1. 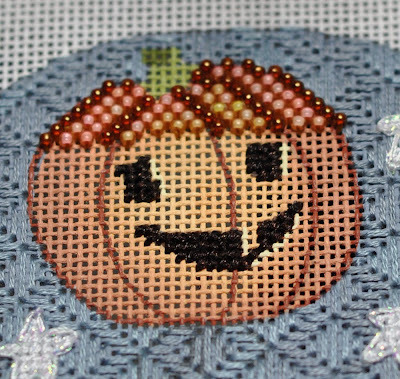 Perhaps reviewing the DVD might further help with the Halloweenies Stitch Guide? Just pop the DVD into your computer, and advance to the Glad Press 'n Seal Demo for a quick look-see. I looked up Glad Press 'n Seal on the Glad website, and it does seem to be available in both USA and Canada. Here's a photo to help you find it in your grocery store. Thank you all for your kind concern. My husband is suffering from a bad case of shingles. Just when we think it is getting better, it fires back up. I have been spending more time with him. I am so thankful it is not life-threatening, but it is really painful. I have also worked a couple of extra days at the shop. Amy's first "Cook-Up" class of 2010 was this past weekend. It is so much fun to see old friends and make new ones. And the best part is watching their canvas work come along over the three days. It is such a unique class. I hope to stitch again on Wednesday. Life has interfered with my stitching time. So I have no progress to report. I hope you are enjoying more stitching time than I am! It's time to discuss the Pumpkin Balloon. I did some beading ... Bricked Beading, that is. Let's start with the basics. Remember the Brick Stitch? I have charted it for you in my new favorite White Lines method. 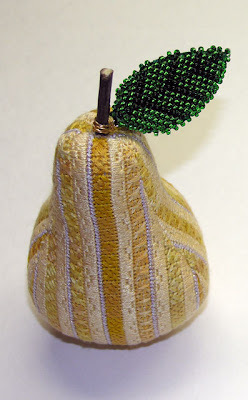 My eyes were opened by Amy Bunger when she mentioned to Peggy to try the Beaded Brick Stitch on Peggy's Pear Leaves. You might have seen Peggy's Pear in the e-newsletter or in the Photo Gallery of Amy's website. Here's the photo to remind you. After seeing the Beaded Brick Stitch in person, I started to incorporate it into some of Stitch Guides I am writing. And yet, I never tried it myself. What is that saying: Do as I say, not as I do? Well, I decided to try the Beaded Brick Stitch on the Pumpkin Balloon. 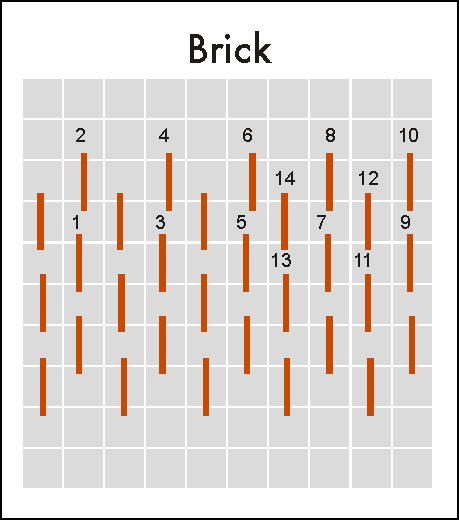 Here's the Charted Diagram for the Beaded Brick Stitch. 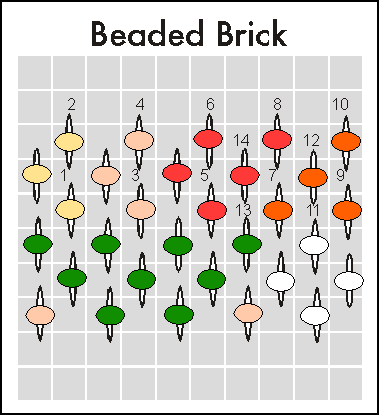 Same as the regular Brick Stitch, but you attach a size 11 Bead (Mill Hill Glass Seed Beads or Miyuki Beads) before you sink the thread. I did use a double strand of Gold Beading Thread, and this canvas is 18 mesh. It is a fun technique to try. I am using 4 different Mill Hill Beads which matched the painted canvas quite nicely. You can see the Brick Stitch pathways from this side-profile photo. So here it is. I LOVE it. Give this technique a try. I am almost finished with Frank's face. Make sure you have plenty of time and patience. And once you are done, be proud of yourself. It is fun to see him come to life. I've used a set of magnets to keep the diagram close to the canvas. 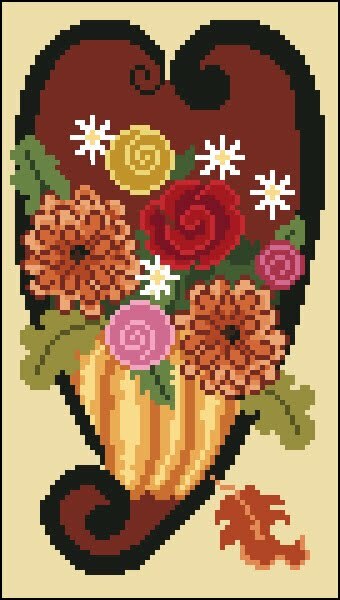 Its a cross stitch trick I that I like to use. Also, use your chenille needles to add wrinkle lines and other outlines. Frank has arrived at Jan's house in Canada. Her son thought it was a perishable package and put poor Frank in the refrigerator. She has saved him from the cold and reunited him with Stirha. What a shock for the poor guy. I am so excited about a new needlepoint club from Kelly Clark. 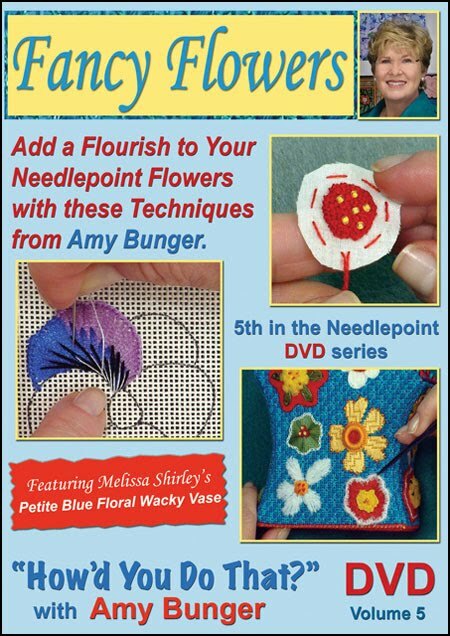 It is designed for beginner and intermediate stitchers. It is offered thru many needlework shops throughout the country. Kelly's Pear Club will offer a series of -guess what- 12 pears, with a Christmas theme. It starts June 2010. Needless to say, it will not be as difficult as the Halloweenies series. So you guys who read this blog and think Halloweenies is too hard for you, check out the pear series. I urge you to support your LNS. If you don't have one near by, choose from the list on Kelly's website. I am seriously considering joining the club through Amy's Golden Strand. Like I need more canvases... I can't quote any prices here but the shops should be getting more information in shortly. Call a shop to inquire. If I stitch them, I will include coverage of my progress here. Next up for me on the Halloweenies is Frank's face. It is done in silks, and is beautifully charted out in the stitch guide. I will start tonight when I can have some serious stitching time without interruptions. I've jumped to the bottom border which is stitched in Reverse Mosaic. I stitched the first squares with the canvas straight up. For the reverse I've turned the canvas 1/4 so that I can still lay my threads easily. Try it. It will look smoother. 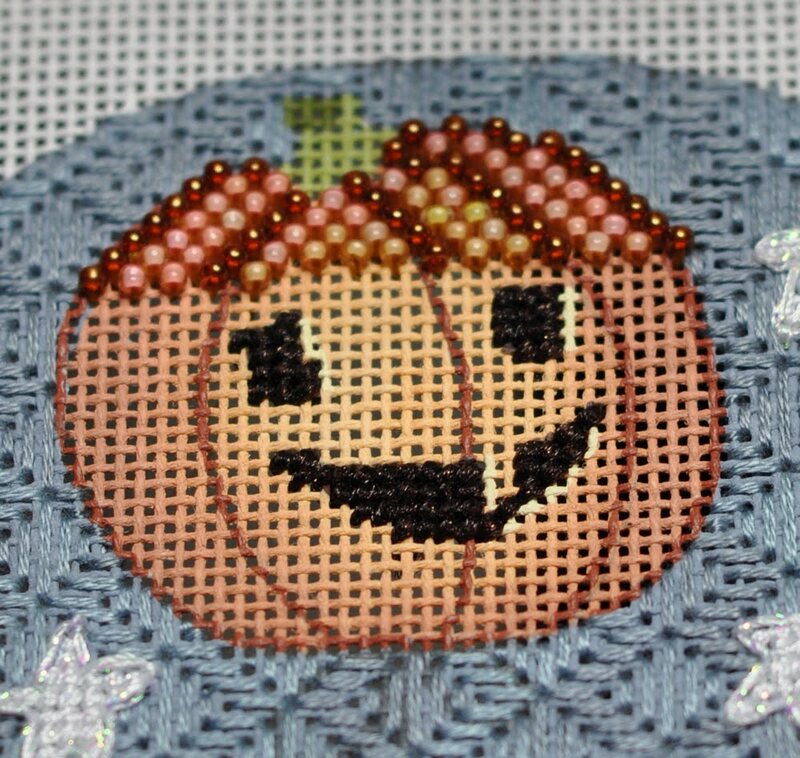 I finished the tent stitch for the background of Frank N. Stein. 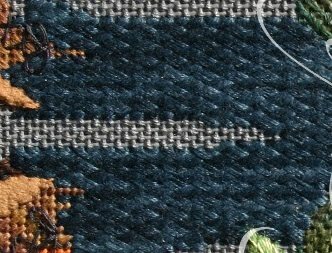 It is a fun stitch to do, but you have to be careful that you don't let holes show behind the canvas in the areas where there is no stitching on top. Following the number system is very important. Amy gives some tips on starting and ending threads. I did a securing L stitch above Frank's head to get started. ((this securing stitch is a problem in that when the finisher cuts around the head this stitch will come out. Amy advises not to do it this way. It would be better to have a long away knot to cut at the knot and anchor after you have some stitching done. Sorry for the confusion.)) When I got to the end of some rows I decided to bury the thread diagonally on the back. I kind of skimmed the thread under the existing row so as not to distort the threads on the top. I found that it worked well for me. There were other times when I was ending a thread close to Frank's coat and decided to do a securing L stitch in the coat area that will be covered up. I sat and looked at the area before starting, trying to determine how and where to bury threads. Then we received a phone call at the shop asking these specific questions. So I knew others may be wondering the same thing. So here is what I did. I hope it helps. Stirha and Frank are together again. At least they are in my home. How many of you have hosted their reunion in your homes? They are really crazy about each other. Amy tells us they have "loving nicknames for each other...Adam and Eve". The background on Frank is skip tent, and it stitches up so fast. Here is a tip. Use a small needle for the skip tent background. You don't want to open up the holes any more than necessary. I used a Bohin 28. I would have used a 26 if I had one. You would not believe how many needles I have, and no size 26! And once again Amy has beautifully charted the face. Remember to refer to her diagram rather than stitching by the color on the canvas. I am not there yet, but I learned on Stirha's face and hands to use the diagram. Here is a final look at Amy's version of Stirha Cal-Dron. The beads are so much fun. Well here it is the first of April and I am still putting beads on Stirha. But I am please with my progress. I need to finish the beads and make the fire and the logs. But I am going to set her aside tomorrow and start on Frank. He is just so darn cute. The stitch guide is just great, so I must get on it. I am happy to report on the Bead Explosion Kit we featured a few months ago. Sundance has released the kit with all of the bead tubes labeled. The lack of labels is the one thing I disliked about the kit that I saw from market. So thanks to Cassandra and Nandra of Sundance Designs. 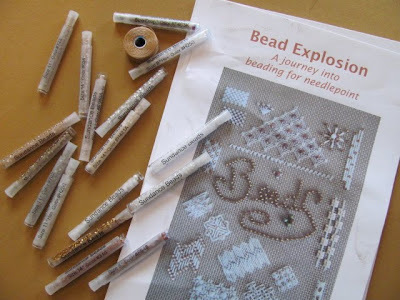 This will help me learn more about the kinds of beads that are out there and the effect they may have in our needlework. I will try to work this project in to my schedule this month! That's another reason to get to work on Frank, (and finish Stirha).